Turkish Airlines Miles & Smiles has launched a sweepstakes to promote its 30th anniversary. EACH month between now and the end of 2019, 30 lucky Miles & Smiles members will win 100,000 miles. You are allowed to enter ONCE PER DAY. Unfortunately this does rather lengthen your odds of success, unless you are able to remember to enter the sweepstakes every day between now and the end of the year! What Can I Do With 100,000 miles? 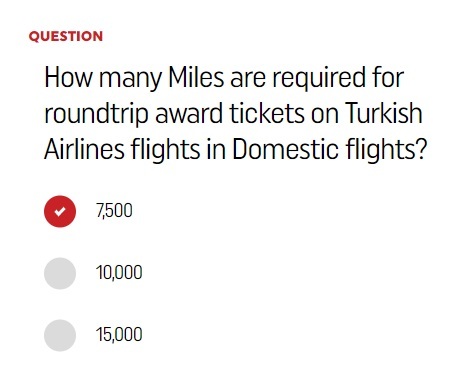 Even if you aren’t a member of Turkish Airlines Miles & Smiles, 100,000 miles can still come in quite handy. You only need 90,000 miles for a return in Business Class to Asia and North America (on Turkish Airlines or any of its Star Alliance partners). You could even get to Australia / New Zealand for 105,000 miles!